"Where My Heart Is" is the sensational second single from arguably the United Kingdom's favourite child actor Maisie Smith, who the nation saw grow up before their very own eyes on critically acclaimed and award-winning BBC One hit television show "EastEnders"; Maisie Smith gained widespread national attention when appearing throughout her beloved stint on "EastEnders" (Smith debuted on "EastEnders" at age 6), playing Tiffany Butcher where the gifted actress won various coveted UK acting awards including a British Soap Award for "Best Young Dramatic Performance". 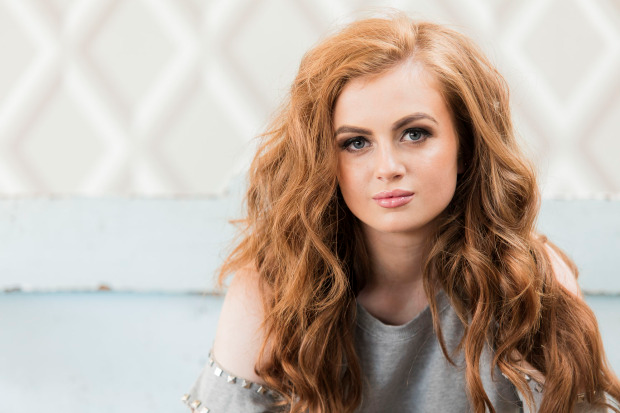 "Where My Heart Is" excellently follows up from Maisie Smith's impressive debut single "Good Thing" which was supported by The Mirror, Metro and The Mail Online, whereas the young Singer-Songwriter/Award-winning Actress also performed "Where My Heart Is" acoustically for acclaimed British mainstream media publication The Sun. The multi-talented Westcliff-born teenager has also made special guest mainstream UK television appearances on Loose Women, Children in Need, Bookaboo, Sam & Mark’s Big Friday Wind Up and Hacker Time and The Michael McIntyre’s Show. Smith - who lives with her family in Leigh on Sea, Essex - has always had a deep passion for music and performing live; Maisie Smith plays guitar, whilst composes, dances and choreographs her own routines. Maisie Smith commenced her award-winning acting career at the tender age of four, starring alongside "Captain America: Civil War" Hollywood actress Scarlett Johannsson in "The Other Boleyn Girl" where she played Queen Elizabeth I. 3-time Award-winning and Future 100 certified lifestyle publication In-spire LS Magazine caught up with talented Singer-Songwriter/British Soap Award-winning Actress Maisie Smith to talk about her incredible brand new single "Where My Heart Is", The School Tour with Aaron Martyn, her successful tenure on BBC One hit television show "EastEnders", remaining grounded regardless of success, being dubbed "The Nation's Favorite Child Actor" by the mainstream British media and much more only and exclusively on In-spire LS Magazine. Q: First and foremost Maisie, your exceptional brand new single "Where My Heart Is" has officially garnered broad critical acclaim. Can you explain the lyrical meaning behind "Where My Heart Is"? Thank you. I am really proud of this single ("Where My Heart Is") as it means a lot to me. The lyrics symbolise my passion for music as this is where my heart is at the moment. I also wrote this song to inspire others to follow their dreams like I did. Q: Metro, Mail Online, The Mirror and The Sun are among the very reputable mainstream media outlets which have provided positive coverage ever since you released successful debut single "Good Thing". Do you somewhat feel as though your transition from an award-winning actress to a fully fledged and credible recording artist has been confirmed courtesy of the mainstream media coverage that you have received from the aforementioned media publications? The media coverage has definitely supported my career change and I feel grateful that they've been behind me. Q: Who do you cite as your all-time music influences? Without any hesitation, Christina Aguilera is my all-time music influence. I love the way she can cross between music and acting as this is something I would like to do in the future. One of my favourite films is "Burlesque". Q: The School Tour with Aaron Martyn has been a sterling success and has richly inspired students courtesy of the outstanding performances, positive messages and incredible interaction. What's been the major highlights of The School Tour thus far? The support I received from the audience really uplifted me and there were some moments where I felt emotional and grateful. There was a particular moment where one of the girls came to me after the show and told me that I had inspired her to perform and that was very special for me to hear that. Q: Children's CITV, Loose Women, Children In Need and The Michael McIntyre Show are among the array of very popular television shows which you have made special guest appearances on. How would you describe your experience on these highly-rated shows? Its always an honour to be asked to appear as a guest on these shows and I always make sure I enjoy myself incase I'm never asked again. Q: Dubbed as "The Nations Favorite Child Actor" by the British media is a very huge compliment and conversely very overwhelming simultaneously. What keeps you so grounded and so humble irrespective of the many kudos and accolades that you have received in your career? I just feel as though I'm the same as everyone else and I'm just doing what I love and luckily people seem to appreciate it. Starting from such a young age I was never aware of the concept of fame, which I strongly believe is why I don't see myself as a celebrity. Q: Claiming various sought-after awards during your very successful tenure on BBC One's hit television series "East Enders" is most certainly another proud moment in your entertainment career. Which particular actresses and actors did you learn most from during your beloved time on "EastEnders"? Probably Patsy Palmer as we worked closely together for many years and she taught me some valuable lessons in the world of acting. Also, Charlie Brooks taught me to never turn down opportunities of work no matter how small because it's all good experience. Both actresses are very grounded and guided me through my time on East Enders. Q: How was your experience in starring in historical drama film "The Other Boleyn Girl" alongside Hollywood superstars Benedict Cumberbatch, Natalie Portman, Eric Bana and Scarlett Johansson? To be honest, I didn't even know who they were as I was only four at the time, but my dad was very happy to chaperone me on set alongside Scarlett Johansson. Q: A humble and multi-talented 15-year-old girl from Leigh-on-Sea who is also currently studying for her GCSE's. How do you remain to successfully balance your academic studies with your media work without any distractions? In all honesty, it takes a lot of hard work and many late nights and early mornings. But I believe you only get out what you put in and I'm not prepared to fail my exams. Q: Thank you ever so much for your time, Maisie. But before we leave, do you have any inspirational words of wisdom that you would like to share with In-spire LS Magazine readers who are seeking inspiration and motivation in their life and career? Thank you for your kind words throughout this interview. All I would say is never give up on your dreams. If you are committed enough you can make them happen. Finally, I strongly believe that it's not about the fame, it's about the passion.